Click the phone for a cut-down version for your Smartphone including the latest news and 14 day calendar. 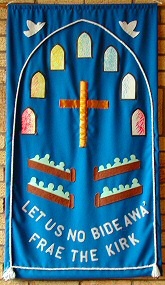 Bennochy Parish Church is a friendly community Church situated in central Kirkcaldy, Fife. At the heart of the local community, we seek to meet the needs of young and old, those on their own or with families. We can also help with Baptisms and Weddings. We hope you enjoy visiting our site and wish to participate in the life of the Church and its organisations. All welcome to join our new Yoga classes. Join us on a short walk around Lochore Meadows. We are changing how our notices and events are advertised in the Fife Free Press. Join us as we enjoy a fun Bunny Drive. Monday April 15th Linktown Church, 7 p.m.
Tuesday April 16th Congregational Church (West end), 7 p.m.
Wednesday April 17th Bennochy Church, 7 p.m.
Thursday April 18th St Bryce Kirk, 7 p.m.
Friday April 19th Abbotshall Church, 7 p.m.
Linktown Church will be open from 10am-4pm with a service at the garden cross at 4 p.m. The Congregational Church will have a Good Friday reflection from 2.30–3 p.m.
Easter Sunday April 21st - Garden sunrise service at Auchtertool, 5.45 a.m. Beveridge Park, 8.30 a.m.
Sunday April 14th Palm Sunday celebrations, 11 a.m.
Wednesday April 17th Joint Holy Week service, 7 p.m.
Read the Spring Newsletter from KART. The March 23rd Prayer Diary has now been published. The March 16th Prayer Diary has now been published. 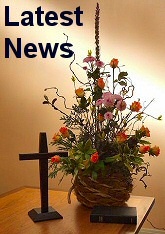 The March update from Crossreach is now available. Our community café is open every Thursday from 11am until 2pm and now includes an Internet Café with support to assist you with any web related activities. For the church of Scotland, the next era, is going to be one of significant change. At this year's General Assembly a new radical action plan will be debated. At presbytery, there are conversations taking place about the creation of a Presbytery of Fife, bringing the three presbyteries of Dunfermline, St Andrews and Kirkcaldy together. And Kirkcaldy presbytery is in the midst of restructuring its own Presbytery plan, that will have direct implications for every charge in the Presbytery, including Bennochy. When so many ministers are soon to retire, where should the ministries of the church be placed, and what are the suitable, 'fit for purpose' buildings, that will take forward the mission of the church. Bennochy will not be immune to these changes, and nor should we. Bennochy Parish Church was formed in 2010 by the union of St. Andrew's and St. John's Parish Churches. You can visit our history pages which cover the history of both Churches and recent events at the new Church.